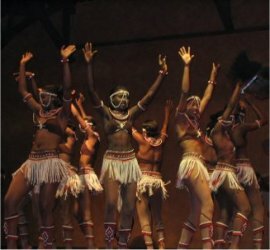 This page gives a concise overview of the major Kenya art forms: music, dance, Sigana, theatre and performance, literature, cinema, crafts and other Kenya art. Benga is a truly Kenyan music style. Benga is high-energy dance music that originated after the 1940s when Luo musicians started playing traditional tunes with modern electrical instruments. Most other popular music styles have received influences from abroad. Taarab is the traditional Swahili music played at the coast, and is heavily influenced by Arabic and Indian music styles. Lingala – modern upbeat party music - came from Congo, where the deteriorating political situation made many artists flee to East Africa. American hip hop and gangsta rap has infiltrated Kenya like a virus. Pictures of 50 Cent and Snoop Dogg are everywhere in Nairobi. More information is on our separate page about Kenya music. The hypnotic swaying and leaping in Masai and Samburu dancing, are the best known forms of Kenyan dancing. In their energetic dancing, warriors display their strength by leaping high in the air. The Masai and other tribes perform regularly for tourists who visit their villages. In tourist venues along the coast, Mijikenda dance groups often give performances. Sigana is a traditional performance art which contains elements of all the major Kenya art forms: storytelling, song, music, dance, rituals etc. Active participation is a key feature of sigana. The line between performers and audience is less clear than in many other Kenya art forms. You won’t see these often along the tourist trails, but the Mzizi Arts Centre in Nairobi (see the address below) organizes monthly Sigana performances. There are several theatre groups in Kenya, most of them based in Nairobi. Names to remember are the Mbalamwezi Theatre Group and the Phoenix and Miujiza Players. They often perform at the foreign cultural centres in Nairobi, Mombasa and Kisumu. In Nairobi, there’s the Kenya National Theatre. It’s known for the controversy it created with the production “I Will Marry When I Want” by Ngugi wa Thiong’o and Ngugi wa Mirii, which brought them into confrontation with the government. Kenyans reportedly also like of satire and stand up comedy. One popular group is Redykuylass (‘Rediculous’) which featured in a weekly TV program with a mix of political and social satire. In Kenya, oral narratives are the oldest form of literature. Oral stories are still important in many communities. Written literature, in Swahili and English, emerged in the beginning of the twentieth century. However, only after Kenya’s independence (1963) a body of national literature came into being. An important author (novelist, playwright and essayist) is Ngugi wa Thiong’o. As a child on missionary school, he was a devout Christian, but later he rejected Christianity and became a fierce critic of colonialism. He changed his name from James Ngugi to Ngugi wa Thiong’o in 1976 and embraced his native Kikuyu culture, as well as Marxism. While having written the first novel in English by an East African author - “Weep not, child” (1964) – he published his first book in Kikuyu in 1980: “Caitaani Muthara-Ini” (Devil on the Cross). He now argued that literature written by Africans in a colonial language is not really African literature. In 1992 Ngugi became professor of literature at New York University. There is a small film industry in Kenya, which is struggling to stay alive, like elsewhere in Africa. However, a new generation of Kenyan film makers is emerging, inspired by the success of the Nigerian video industry. One such film director is Kibaara Kaugi, who in 2004 produced the acclaimed “Enough is enough” - a narrative of the famous Mau Mau uprising – on a minimal budget. Also, foreign film makers have used Kenya as a backdrop for their works. The most famous example is of course Sydney Pollack’s “Out of Africa” (1985) with Merryl Streep and Robert Redford, which is about the life of Danish author Karen Blixen, who emigrated in the 1910s to Kenya to become a coffee farmer. A recent international movie is “The White Masai” (2005), after the real story of the Swiss woman Corinne Hofmann who married a Samburu warrior and joined tribal life. There is no happy ending here. These and other movies are reviewed on my movies about Kenya page. Some Nairobi cinema houses are 20th Century Cinema (Mama Ngina Street), Fox Drive-In Cinema (Thika Road) and Nairobi Cinema (Uchumi House, Aga Khan Walk). 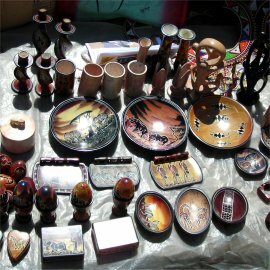 In Kenya you will find much beautiful and fine craft work. It’s sometimes amazing to see people in rags sitting outside their ‘home’ (if you could call it that), and produce wooden carved tables and chairs of a beauty you won’t see anywhere in North America or Europe. Most crafts are produced for tourists. It’s best to set aside any purist misgivings you might have over their authenticity, and just enjoy them for their own beauty (which they often have). Compare this to American or European culture, which is also eternally developing. The Beatles are just as ‘truly European’ as Beethoven is! Wood carvings of people and animals can be bought everywhere. Classic are the very long sculptures of women carrying baskets on their heads. Soap stone objects are another popular for of Kenya art. Soap stone is mined in western Kenya by the Gusii and Abigusii tribes. They then produce beautiful sculptures, chess sets etc. from it. Each piece is carved individually by the craftsmen and then wet sanded, polished and dyed all by hand. Soap stone products can be bought everywhere in Kenya. 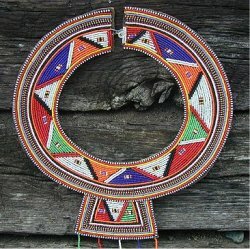 Jewelry (often in the form of beads) are another Kenyan speciality and they can be bought in all colours of the rainbow. Jewelry is important in African culture. Much Kenyan jewelry contains cowry shells. They are not only beautiful but also symbolic. Masai spears and shields are also popular souvenirs. But first check with your air company and your customs whether you can take them home. Another solution is having them sent home by mail. Some tourist shops offer this option. The Saturday edition of the Daily Nation – Kenya’s leading newspaper – has a good section of what’s on regarding Kenya art across the country. For more details on the Kenyan cultural scene, contact the Mzizi Arts Centre in Nairobi (Sonalux House, Moi Avenue, tel 02-574372, email sanaa@insightkenya.com). This centre publishes the fortnightly Sanaa freesheet with Kenya art reviews and news on cultural events.